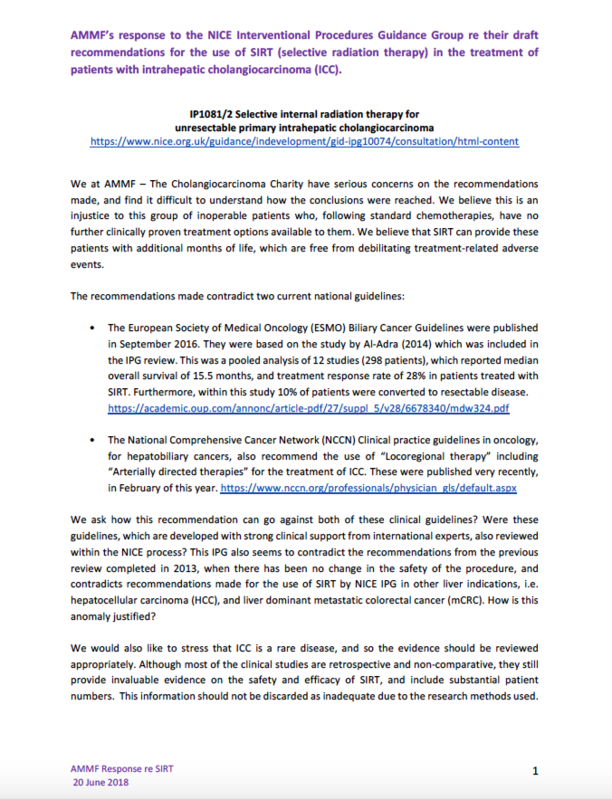 NICE (National Institute for Health and Care Excellence) are currently consulting on the safety and efficacy of SIRT (selective internal radiation therapy) for intrahepatic cholangiocarcinoma, and have made their draft recommendations available for comment. * The draft recommendations suggest there are safety concerns, and that evidence on the efficacy of SIRT for the treatment of ICC is inadequate in quality and quantity. * SIR-Spheres Y-90 resin microspheres are now used globally, and SIRT is an established intervention, with a significant amount of supporting evidence. * The review highlights some adverse events, and acknowledges they are rare. This conclusion is supported by evidence (in both intrahepatic cholangiocarcinoma and other indications), which also outlines recommendations for the prevention of these events. * Intrahepatic cholangiocarcinoma should be viewed and evaluated as a “rare disease” so the evidence should be evaluated from this perspective. An additional concern to AMMF with regard to this report is that funding for this treatment is currently under consideration by NHS England. NHS-funded SIRT had been available for patients with intrahepatic cholangiocarcinoma through the CtE (Commissioning through Evaluation) programme until this funding was withdrawn on 31st March 2017 ‘to be evaluated’. This evaluation is ongoing. However, although the NICE IPG process considers only efficacy and safety and not cost-effectiveness, AMMF is concerned that NHS funding is unlikely to be restored for a treatment that is not recommended by NICE. And so NHS patient access to this treatment will be denied. AMMF has, therefore, submitted a comment to the NICE IPG and has also written to Sir Andrew Dillon, Chief Executive of NICE. 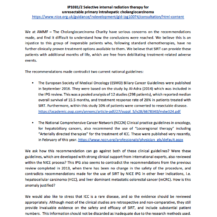 Although NHS funding for treatment of intrahepatic cholangiocarcinoma by SIRT has been withdrawn, this may be accessed privately or via a clinical trial.